At Winter NAMM 2016, JBL Professional by HARMAN is showcasing a new lineup of monitor system controllers designed to enhance the workflow in music recording, post production and broadcast control rooms. Three models and one bundle provide the essential level and source selection controls needed in today’s computer-based production systems. The new controllers are ideal for use with JBL’s successful 3 Series Studio Monitors and can be used with any studio speaker system. In a compact desktop form factor, the Nano Patch Plus serves as the volume control between the output of the production system and a pair of studio monitors. The unit features balanced combo XLR/TRS and stereo mini TRS input connectors, balanced TRS and stereo mini TRS outputs, and an all-passive circuitry for a high-quality signal path. The top panel features a large, comfortable volume control for precise level adjustments and a system mute switch. The M-Patch 2 stereo controller and switch box can be placed on the desktop and is rack-mountable to provide versatile switching and dedicated level controls for two stereo input sources. Signals are routed to two sets of balanced outputs with A/B selection and selectable stereo-to mono summing. The unit features an integrated headphone output with a dedicated level control. The M-Patch ACTIVE-1 desktop controller integrates versatile monitor system controls and USB connectivity to make the ideal monitoring controller in computer audio production systems. The M-Patch ACTIVE-1 allows selectable monitoring of four input sources via three stereo analog outputs. Integrated USB connectivity allows direct digital audio recording and playback when used with a computer audio system. The front panel features a precision volume knob, and controls that allow mute, dim and mono summing of the monitored signal, In live recording applications, a footswitch-activated talk-back system with integrated condenser microphone and selectable routing allows communication with talent, making the ACTIVE-1 the ideal solution for a broad range of studio production applications. 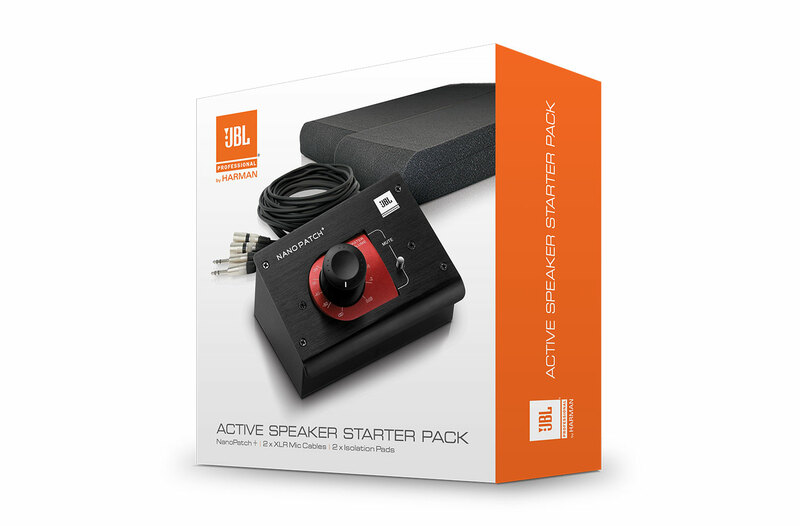 JBL also announced the Active Speaker Starter Kit as the ideal add-on to JBL 3 Series Studio Monitors. The Kit bundles two studio monitor isolation pads with the Nano Patch Plus volume controller and four 3-meter male XLR-to-TRS cables. The kit makes it easy to connect a computer audio system to a pair of powered studio monitors, providing a clean monitoring path and volume control for an efficient workflow. All models are expected to ship in the UK in February 2016. If you own a pair of studio monitor speakers, then this pack is perfect for you. Our Active Speaker Pack will improve the quality of your home studio with a pair of isolation pads for your monitors, our JBL Nano Patch + volume controller, and four 3 metre cables to make it operational. A great value pack, providing a genuine enhancement to your home studio usability.